There are few milestones in our lives as important as 35 years. It shows that all the work we've put in and experiences we've enjoyed have reached a bit of a culmination that should be celebrated with friends and family. 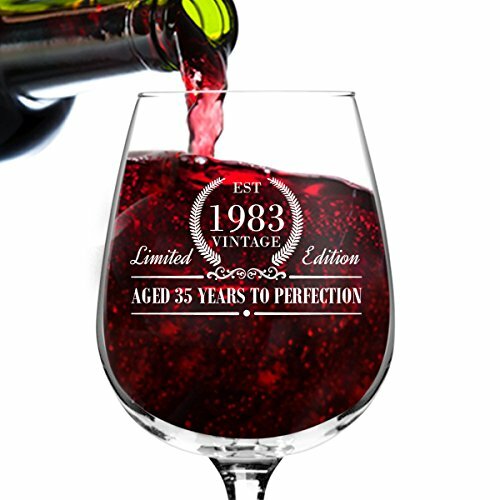 That's why we created these beautifully elegant Limited-Edition "1983" Vintage Wine Glasses that let everyone know how far you've come and remind everyone that adventures in life are still to come! CELEBRATE TRUE ACHIEVEMENT - This beautiful wine glass is part of the Vintage Edition collection designed to celebrate 35-year milestones. CLASSIC, ELEGANT WINE GLASS - The traditional shaped drink glass has a wide deep bowl and narrow top with a sturdy stem and base to highlight beautiful red, white and rose wines inside. TIMELESS, VINTAGE DESIGN - Each 1983 novelty wine glass features striking white lettering celebrating time including Limited Edition, Vintage and Aged to Perfection. DURABLE, DISHWASHER SAFE GLASSWARE - Crafted with premium, food-grade safe glass, these well-balanced wine glasses are perfect for parties, gatherings, and daily use. BEAUTIFUL, PERSONAL GIFT CHOICE - A unique gift selection for wine lovers and enthusiasts, these make a great gift for birthdays, anniversaries, and celebrations.